I know my stuff is a niche market. It’s limited edition, and off beat. A whole gang of tiny wooly cats are now rooming around in my Etsy Shop! All these tiny kittens are siblings and close friends, but they are ready to move out and already spreading into the world. I actually sent one off in the mail this morning. 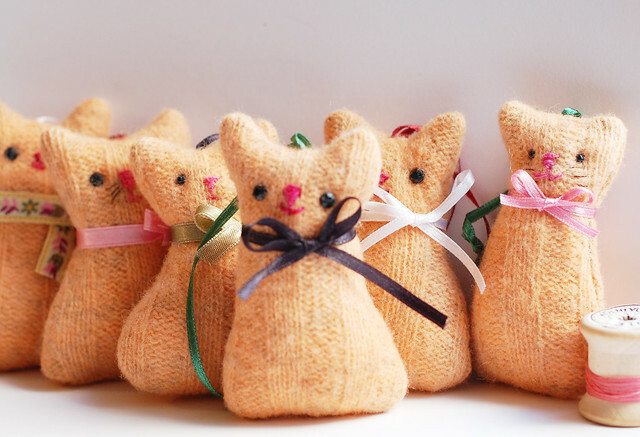 They’re all made out of a hand dyed wool sweater that I felted in the washing machine. Recycled wool is one of my favorite materials to work with. Natural and very environmental, soft but sturdy. And perfect for forming soft ornaments with! I’ve attached a bow around each of their necks for decoration and then hand embroidered nose and mouth. Also added a ribbon hank to hang them from, as decoration or ornaments of some kind. Some of them are in the shop right now! I hope you like kittens! This entry was posted in Fabric & Sewing and tagged etsy update, miniature, ornament, recycling, softies, wool. Bookmark the permalink. I noticed you’ve already sold one of them, probably my favourite! These just make me smile. So cute! I love that point when you are making something like this and the personality is there. Very cute! I love the simple shape and how captivating the little faces. You are so right about putting eyes on any softie – you DO want to say “well – hello there – nice to meet you” – ha! I usually do! Nice to know i am not crazy after all!!! Now that you have dipped back into softie making, I bet we are going to see more! Addicting! These are so very sweet. They have such cute little expressions on their faces. Love the kitties….now where is that sweater in my closet? Much hugs to you during this busy holiday season! xox!